Wonderfully written, with fascinating facts and a riveting story line. 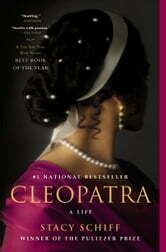 Mythical characters brought to life and the real Cleopatra revealed. A great read! I thought the author deserves alot of credit for how much research that she did. I was especially surprised at the decadent feast antony and cleopatra had on a boat and the rothchild parties. It was nice getting lost in ancient eygpt.